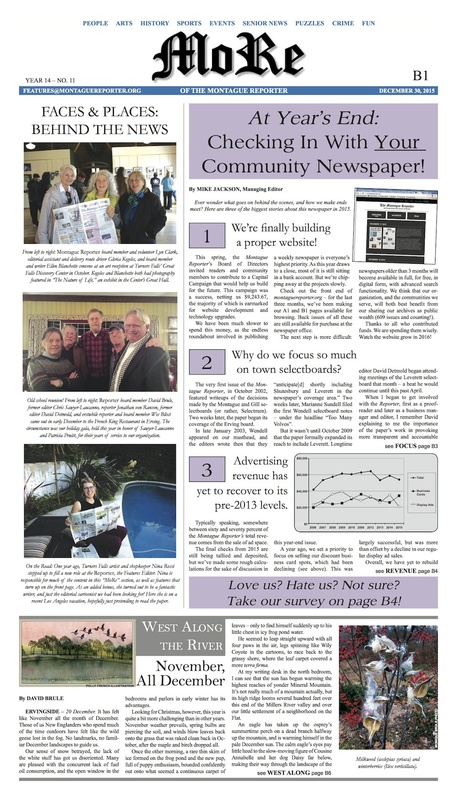 DECEMBER 30, 2015 — It’s a rare Wednesday edition of the Montague Reporter! 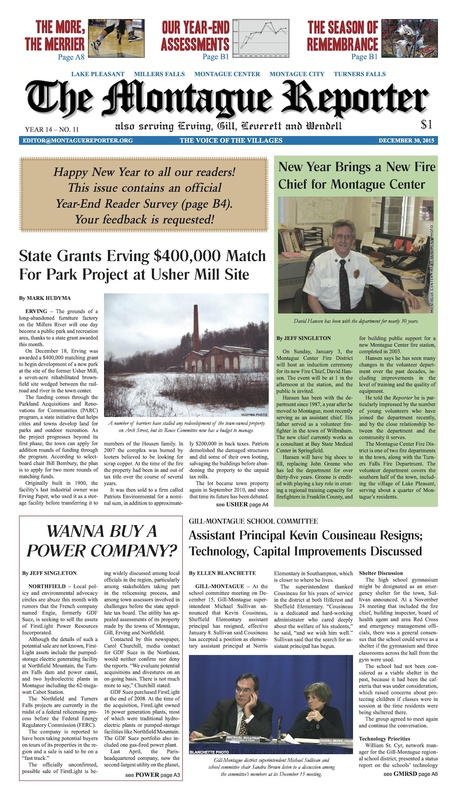 Read all about Montague Center’s new fire chief, Erving’s $600,000 park development grant, and rumors surrounding the possible sale of FirstLight. We’ve got the latest news from the Gill-Montague Regional School Committee, as well as selectboard coverage from Erving, Gill, Leverett, and Wendell. TFHS boys’ basketball draws upon a deeper bench. A guest editorial offers suggestions for moving broadband forward in Wendell, while we reflect upon what occupied our editorial pages in 2015. MoRe: Read about the state of the paper, and take our reader survey! West Along the River takes stock of a November-like December. The Healthy Geezer riffs on implantable cardioverter-defibrillators. Police logs from Montague and Erving; Weird Healing; MCTV listings; Pet of the Week; arts and event listings. Suitable for framing, this Wednesday edition awaits you on newsstands and doorsteps across the region. Happy New Year!